Camping is a time to relax and enjoy everything nature has to offers. It is a time to get a break from the rush of the city and clear your mind for when you return. Many people are still stuck in the past and they continue to believe in the sleeping pad for comfort and while the sleeping pad is still an ideal tool for backpacking, campers can upgrade to the little heavier camping cot for sleeping. The best camping cot has been designed to give you that elevated, feel-at-home sleeping experience in the wild and you will also be elevated from the bugs and rain water soaking the bottom of your ﻿tent. Camping cots are heavier than the sleeping pad and they can certainly become a pain to carry around, but the weight will directly reflect the construction. Children and smaller females might comfortably fit on the 2-3 pound camping cots, but larger males might need to consider the heavy duty cots that weigh a little more. The weight will directly relate to the type of materials used and give you a better sense of the overall durability. 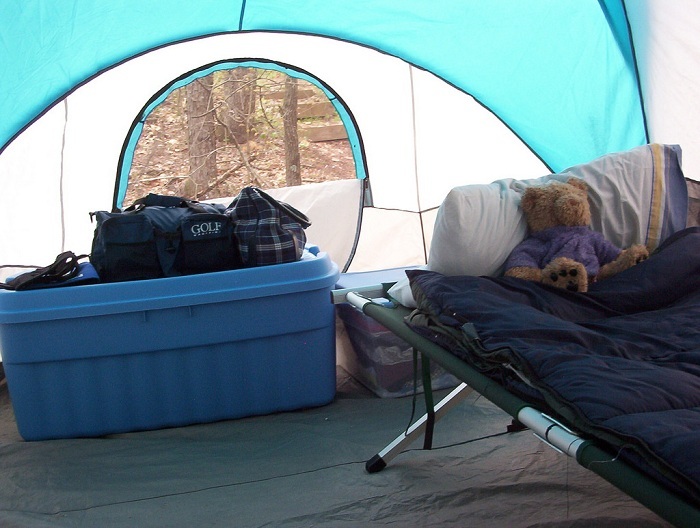 Your body size is important and you will definitely need to take this into account when purchasing a camping cot. 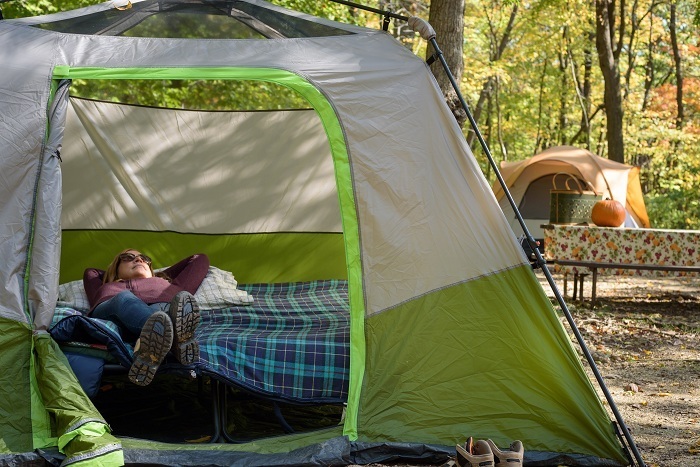 Not all camping cots are the same and the average size you will find on the market will be for adults 25 inches wide and 75 inches long, but bigger ones are also available. All camping cots can be collapsed and folded into smaller pieces, but some do so more than others. Depending on the available space you have when setting out for your camping trip, you will need to look at the collapsibility and how easy it will be to fold the camping cot. When you finally arrive at your camping destination, nothing can be as irritating as a forgotten tool. 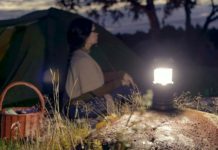 Some camping cots will require basic tools to set up, but these are usually included upon purchase. You should get accustomed with the assembly process to make it easier in the wild. Depending on your budget, you will be able to choose between various fabrics for your camping cot. Nylon and polyester are usually durable and they are quite supportive as well. You should also look at the recommended cleaning process and how you should go about cleaning the cot after use. Comfort is fundamentally important to giving you a good night’s rest and many people forget about this aspect of the cot. The spring system will certainly give you an idea of the softness, while the fabric tension will allow you to either sleep on a flat rigid surface or create the comfortable body hole for you to enjoy the night. The camping cot is stronger and better constructed than the average sleeping pad and they will not only keep you elevated like a hammock would, but they will allow you to freely move around without the fear of falling. The camping cot is also close to the design of a bed and will give you a much better night’s rest. Unlike the sleeping bag and the sleeping pad or tarp, the camping cot is designed from fabrics that will not fold around the body. The tougher the fabric tension, the straighter you will be sleeping and this will keep you cooler on those hot summer evenings. Even though you might think that you are safe inside your tent, there are still many insects that manage to find their way inside. Many of them also burrow through the tent material and then get inside. 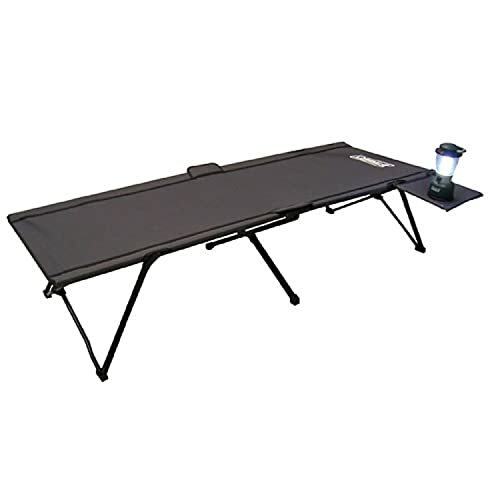 The camping cot will keep you elevated and out of harm's way to ensure that these insects cannot bother you at night. It is impossible to stack some added baggage on top of your sleeping pad and still enjoy the night, but with the camping cot, you will have enough space underneath the bed for you to store various things. One can never have enough safe storage space when camping and this will significantly increase this for you. 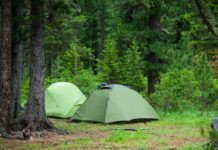 When selecting a sleeping item, you should decide between camping and backpacking and once you have done this, you will find that the camping cot is best-suited for camper and not for minimalist backpackers. The Coleman brand has been setting the trend for quality with outdoor products for quite some time and the Pack Away Cotton camping cot is no different. The cot also features a heavy duty steel frame that will hold up to 300lbs in weight and the tough polyester fabric is ideal for the larger individual. This cot is also one of the wider designs and that certainly shows when it is set up. The width on this cot is 44 inches and it is also ideal for when guests visit your home. The cot also offers you a removable cup holder for beverages and for keeping your personal belongings right by your side. This will also be ideal for a flashlight of sorts. The cot is also lightweight and easy to set up, which should be perfect for people not camping a lot and looking to store the cot away safely. We highly recommend this cot for the value it provides, but it is one of the most expensive camping items you will have. The TETON sports Outfitter XXL camping cot is probably one of the most durable cots you will find. The cot is designed from durable steel materials and when you combine this with the high-quality polyester, you have a camping cot that is bigger than a twin sized mattress and the ability to hold up to 600lbs of weight. The cot folds up quite small when you take into account how big it is initially and this folding process is quite easy and will be ideal for storing almost anywhere in the home. The only downside we could find is the weight and carrying around this 24lbs beast will be quite a challenge. 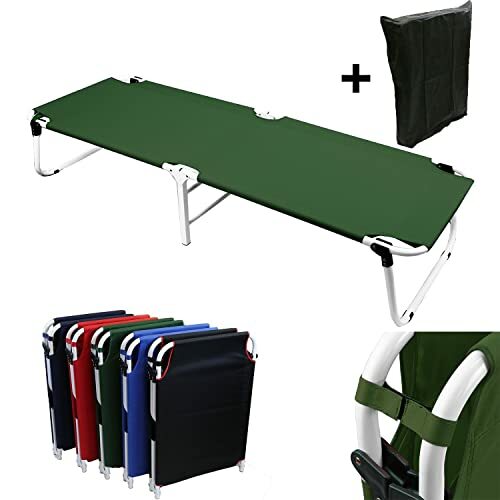 Finally, since this is one of the most durable and functional cots you will find, it is really expensive, but we still recommend it for the versatility and multifunctional use it gives you. This will be the ideal spare bed for your home and it is also backed by a 1 year warranty. 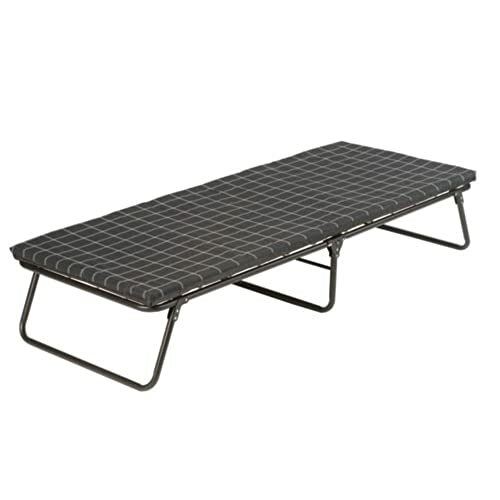 The Coleman Trailhead II Cot is a heavy duty camping cot, designed for the bigger campers. This cot is constructed from a steel X frame to hold the added weight of the individual and it can also be folded once that is required. The heavy duty polyester fabrics combine with the steel frame up to 300lbs of dead weight. When collapsing this cot, you will notice that it is still a little long and will command some extra storage space, but the setup and collapsing process can easily be done without any additional tools. The cot also comes with its own carry bag and this will make it easier to carry if needed and the added 1 year Coleman warranty will ensure that you are protected for those first few camping outings. We highly recommend this heavy duty cot for larger individuals and people who like to go camping a lot, but you might need to add a few more layers on the fabric to avoid the cold and heat escaping on the colder winter nights. It is also worth mentioning that this is one of the most affordable cots on the market. The Magshion Portable Military Fold Up Camping cot is another heavy duty cot for larger campers. The cot might be a little on the narrow end at only 24.5 inches wide, but it will still be ideal for individual who are up to 6 feet tall. The cot is also constructed from durable steel materials and it will hold a maximum weight of up to 300lbs. One of the best features you will have with this camping cot is the smaller size that it folds into and this will be ideal for carrying along with you. To enhance the portability, this cot will also give you a free carry bag to make the storage easier when it is not used and the comfortable Oxford cloth is the ideal fabric that will ensure that you do have a comfortable sleeping experience all night long. This cot is reasonably priced and it is definitely designed for the larger individuals. The added 5 colors you can choose from, will also add some variety to your camping equipment. Looking for even more comfort and heat, the Coleman Comfortsmart Deluxe cot has been designed with comfort as the highest priority. The cot features a durable steel outer frame that will hold individuals of up to 300lbs and the wider size will be ideal for cuddling every now and again. Setting this cot apart from the others is the added foam mattress with coil suspension. This added mattress will be the closest you can get to your expensive bed at home and will ensure that you do get a good night’s rest. The added thickness of the mattress will be ideal for colder nights and will keep the heat from escaping through the bottom. The added mattress does make this cot a little more expensive, but we still highly recommend it to people struggling with back problems and for those colder winter evenings. As with most of the other Coleman cots, this one was is quite easy to collapse and it is also backed by their famous 1 year warranty. Last but certainly not least, we have the king of comfort and this is the Coleman Airbed cot. This camping cot is not as much a cot as it is an airbed and the mattress does inflate to give you all the flexibility needed for your sleep. The frame is made from heavy duty steel and this allows it to have a weight limit of 600lbs. The pump is also included and this can be used with batteries or with a 120V power source to inflate the bed to your heart’s content. This bed is ideal for two people, although it does take up a lot of extra space in the tent. While this bed does provide you with 2 side tables for your personal belongings, we did find the deflating process to be a little time consuming and frustrating at times. 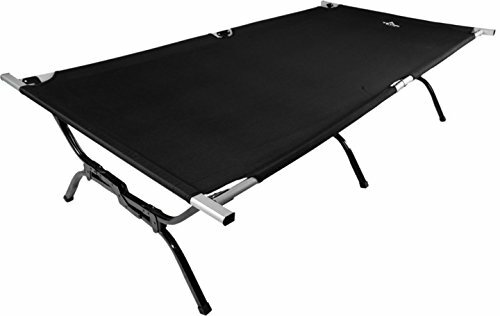 We highly recommend this airbed cot for couples on their camping trip and even though it is expensive you will get great value for your money. The cot is also backed by a 1-year warranty and can be used as the ideal guest bed at home. We would like to thank you for reading this article and we do hope that you managed to find the best camping cot for your next camping trip. 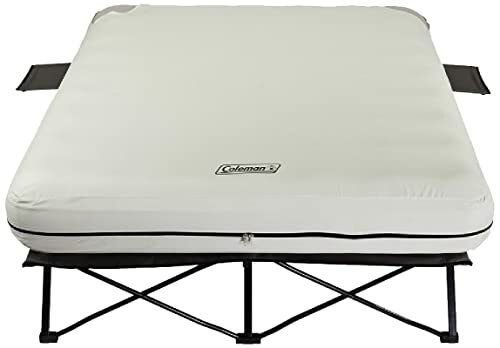 Recommending one is quite tough since these cots are all great, but we have decided to recommend the Coleman brand for the value they provide and the incorporation of many years of experience in their products. Let us know if we might have missed any of your favorites and if you have any experience using one of these camping cots. Please share this with your friends and family to get the perfectly equipped for their next trip. 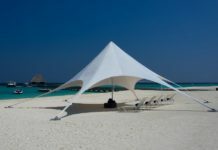 Next articleWhat Is A Tent Footprint And How Could You Benefit From Using One?